Belmont Estate is one of Grenada’s most popular tourism attractions and it’s only just a few miles up the road from us here at Petite Anse. With a restaurant that believes in good food at a good price, a museum full of original artefacts, a fascinating cocoa tour and the opportunity to buy the delicious chocolate bars of the Grenada Chocolate Company you’ll be fully entertained by the estate. 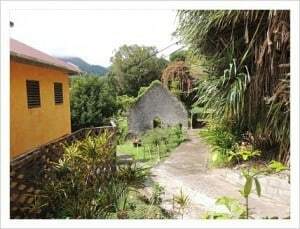 What makes the Belmont Estate unique is that it was the first estate in Grenada to belong to a family from India instead of Europeans. The family still own the estate and have retained many of the items that were used back in 1944 when it was purchased. You’ll be able to enjoy discovering old passports, estate ledges, diaries and kitchen equipment as well as furniture and personal effects from that time. There are a number of attractions at the estate – look out for donkeys, parrots, sheep, goats, cows, chickens, tortoises and a horse. You’ll also be able to enjoy a walk to the top of the hill to look out over the Caribbean Sea to the Grenadines. On your way you’ll pass the burial site of John Aitcheson, the one-time Scottish owner who passed in 1780. There’s also a pretty riverside garden to discover with fruit trees, tropical plants, flowers and palms. As a working cocoa fermentary, local growers bring their cocoa beans to the estate to prepare them for use. Depending upon when you arrive you might be lucky enough to see the ‘cocoa dance’, a barefoot treading dance in a ‘copper’ basin that was performed to remove the fermentation residue from fermented beans. The restaurant serves a buffet lunch variety of local dishes including chicken, callalou and fish in addition to local fruit juices and has excellent reports on TripAdvisor. In fact TripAdvisor awarded a 2013 Certificate of Excellence to the Belmont Estate Restaurant for their service. Be sure to check out the reviews yourself so that you know what to expect. To find out more about Belmont Estate and its historical and modern day offerings visit their website http://www.belmontestate.net/. They are open everyday apart from Saturdays. Our last word….. if you’re a chocolate lover – be sure to try the chocolate mousse in the restaurant. You won’t regret it! .